As USA TODAY, the Nation's No. 1 Newspaper, noted, Lady Gaga is an "Overnight sensation who went from a Yonkers [New York] lounge act to, well, a fame monster." 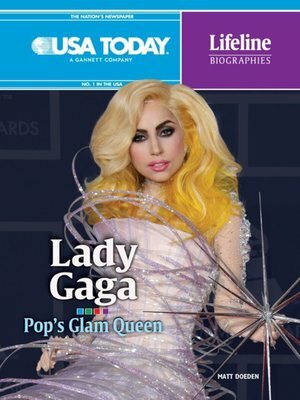 The meteoric rise of Stefani Germanotta, aka Lady Gaga, to the top of the pop charts surprised some. But Gaga spent years working, waiting, and honing her craft in the underground New York music scene, until her singles "Just Dance" and "Poker Face" launched her to international fame in 2008. She has developed such a large and loyal fan base that in 2011, Forbes magazine ranked her as No. 1 on their annual Celebrity 100 list of top moneymakers. An outspoken and avid supporter of LGBT (Lesbian, Gay, Bisexual, and Transgender) rights, Gaga values inclusiveness: "To me there is nothing more powerful than one song that you can put on in a room anywhere in the world and somebody gets up and dances." From her sudden rise to the top to her musical integrity and social activism, Lady Gaga has the world under her control. And her orders? Just dance!